In short, General Shepherd assumed a semi-independent command, necessitated by the wide dispersal of 1st Marine Division forces as a result of seizure of the airdrome and engagement on two separate fronts separated by five to six miles of road kept usable only by herculean efforts. Because all of the various ramifications of planning had contemplated some such division of responsibilities, the general and his staff were especially well prepared for the function which now devolved upon them. For implementation of this double-barrelled mission, two major components passed under ADC control. First, was the Shore Party operating on the YELLOW Beaches, consisting of the 2d Battalion, 17th Marines (pioneers) plus C/17, supplemented by a recently arrived replacement draft, and elements of the 1st Motor Transport Battalion and 1st Service Battalion. For assault troops, General Shepherd had Combat Team C (7th Marines, reinforced), still in position on the old perimeter line, to which was added Landing Team 35 (3d Battalion, 5th Marines, reinforced). This unit arrived in two echelons on 30 and 31 December and was designated group reserve. It moved initially into position behind the 2d Battalion, 7th Marines and sent some elements forward to reinforce that depleted unit, which it shortly relieved. The basic tactical situation was essentially clear and simple. By now the ineffectual nature of the Japanese defense of the airdrome had convinced the Marine command that General Matsuda had retained his major strength in the Borgen Bay area without attempting to support Colonel Sumiya. Obviously, this force must be destroyed or driven off before the advantages gained could be fully exploited. But its exact composition and disposition remained undetermined in light of such specific information as has been obtained up to this time. COMMAND CONFERENCE during the drive to the southeast. Left to right are General Shepherd, Lieutenant Colonel Luckey and Colonel Frisbie. The terrain over which the attack must move remained equally a mystery. The most prominent feature--indeed, the only one of any real prominence--was Hill 660, lying close to the shore of Borgen Bay some 2,000 yards almost due south of Target Hill. Between the two, a lower, narrower ridge, designated Hill 150, lay athwart the left sector of the line of advance. Two sizable kunai patches occurred farther inland (westward), but otherwise dense vegetation blurred the contours and masked such features as swamps, streams, trails, troop concentrations and command posts, including Matsuda's own brigade headquarters, which prisoners spoke of vaguely as being located on rising ground several miles in from the bay. forward to Magairapua, where he set up his own command post and assumed command of all the Japanese combat troops in the Natamo (Borgen Bay) zone of action. Just why Matsuda, a major general, chose to pass over full responsibility for a command of such size does not appear on the record.10 As pointed out previously, he was essentially a transportation expert rather than a combat leader, and quite possibly his dismal bungling to date convinced him of his own ineptitude. In any event, Katayama issued the tactical orders from this point onward, leading to the most stubborn and bloody fighting the operation produced, and which might have been even worse for the Marines had not Matsuda passed along his faulty intelligence as well, thereby causing the colonel to open this phase of the campaign with a costly blunder. Newly arrived on the scene, Colonel Katayama perforce accepted the 65th Brigade Staff's estimate of the invaders' strength: that curious 2,500 figure which kept cropping up in Japanese documents throughout the first week of the operation, even as arrival of additional troops brought American strength to nearly ten times that number. On this basis, he determined to assume the offensive in force, a plan in which he persisted even after the sudden, violent coming-to-life of the hitherto quiescent inland sector of the Marine perimeter on 2 January might have awakened him to the true situation. 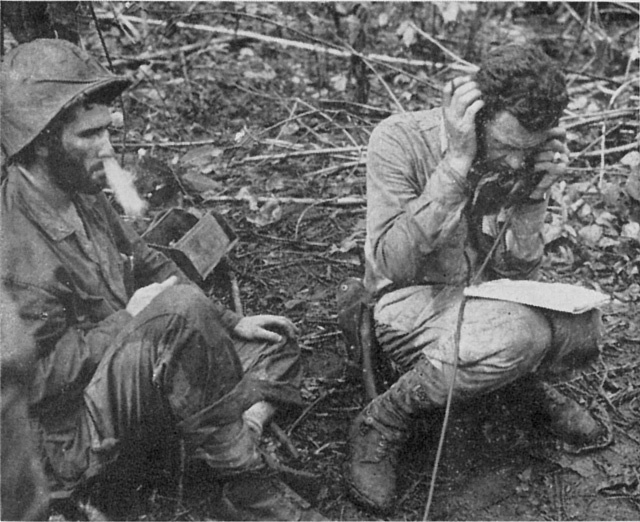 A COMMUNICATOR'S LIFE in the dense jungle was not a happy one. allow more time to rest the newly arrived battalion and to coordinate preparatory fires. For this was to be no haphazard affair, cooked up on the spur of the moment, as documents brought along by the commander and others made clear. Orders were issued in elaborate detail, and unit commanders corresponded at length to insure the utmost in cooperation from all the artillery, mortars and automatic cannon in the area.15 Under cover of darkness, assault troops and engineers hacked steps into the steep lower slopes of the hill to facilitate scaling. 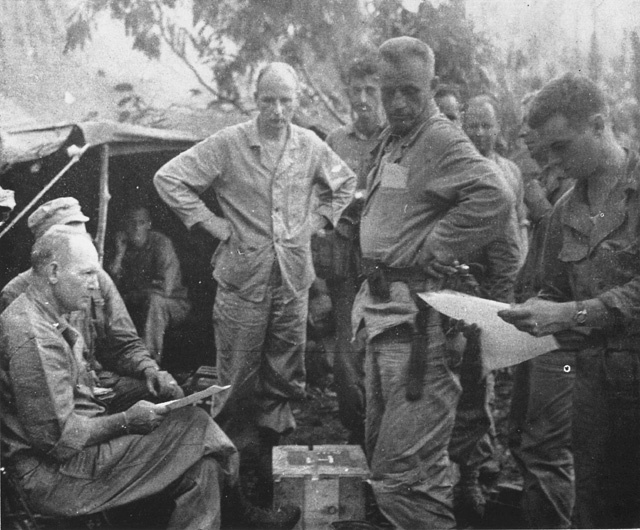 COMMAND POST of 1st Battalion, 7th Marines, Lieutenant Colonel John E. Weber talks on the telephone, his map on his knees. The Japanese placed mortar fire on the hill to cover their step-digging activities, but they made so much noise at the work that by about midnight the 12 Marines posted on the forward nose had a pretty good idea of what was going on. Then, as the attack was launched, the enemy added fire from artillery and 20mm machine cannon, plus knee mortars and machine guns below the hill. 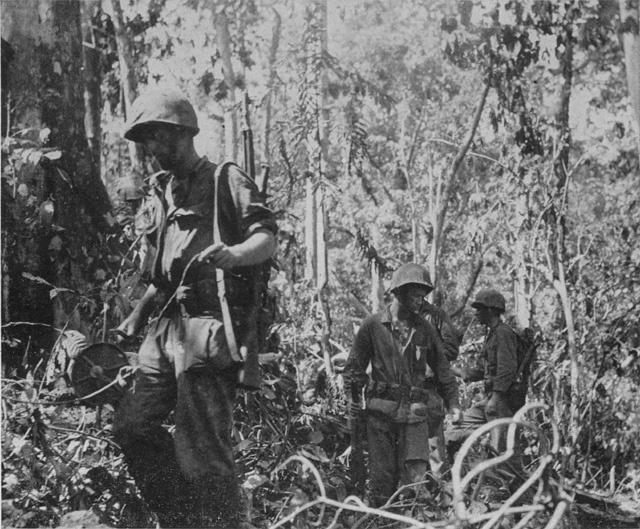 MARINES CROUCH in the New Britain jungle awaiting the signal to move on. For by this time General Shepherd had issued his operation order, and his men were more concerned with their own attack, even now developing some distance farther inland. General Shepherd issued ADC Group Operation Order No. 1-44 on 1 January, and the resultant attack that jumped off at 1000 the following morning might have served warning on Colonel Katayama that he was up against a force of considerably greater magnitude than General Matsuda's extraordinary optimism had led him to expect. However, the fact that the Marines' gains on 2 January were something less than spectacular, and the movement largely concealed by the jungle, may have contributed to his continued self-deception. At any rate, he carried through the fruitless and costly operations aimed at regaining Target Hill, as described in the previous sub-chapter, apparently quite unaware of the situation developing on his left. 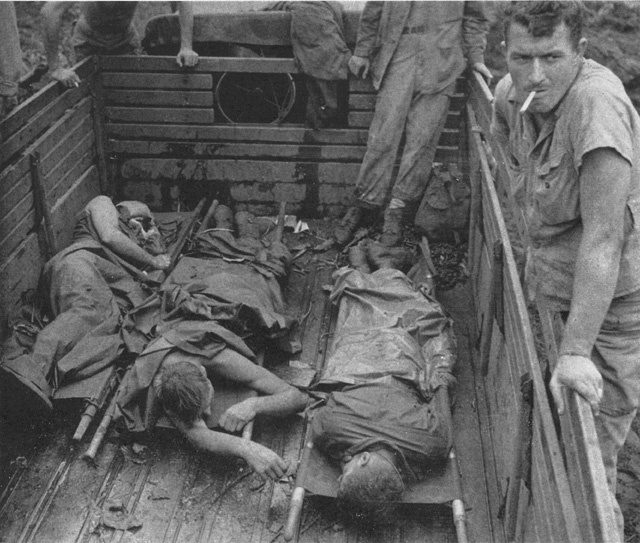 WOUNDED WERE TAKEN out in tractors and then transferred to trucks for the trip to the evacuation hospital. unit and tying-in the left of 3/7 with the right of 1/7. The drive would then enter its second phase, changing direction more to the south. No one discounted the difficulties imposed by both the terrain and the enemy. 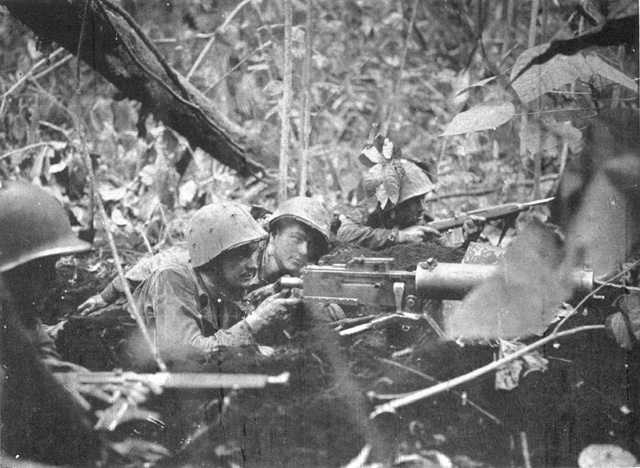 The men of 3/7 hacked their way laboriously through the jungle for a distance of about 300 yards, where they came up against the prepared positions that the Japanese had been constructing for the past week in front of 2/7, and had their forward progress rudely halted by a heavy volume of rifle and automatic weapons fire. The 3d Battalion, 5th Marines, with a greater distance to travel, encountered less resistance during the early phases. Patrols working well off the right were encouraged to discover no signs of the enemy in that direction. But when they attempted an encircling movement from the west, the assault troops soon encountered the face of the same Japanese pocket that was holding up 3/7 and were halted in turn. As a result, the attacking lines on the night of 2 January, and throughout 3 January, resembled a huge letter "U", with the enemy strong point contained on three sides, as shown on accompanying map. Liaison between the battalions in assault presented special problems owning to the denseness of the jungle, and contact was frequently lost. This situation was not simplified by the presence of the previously mentioned stream, now richly earning its name of Suicide Creek, which wound its way in a generally north-south direction across the front of 2/7, intersecting the line of advance of 3/7 and 3/5. Recognizing this as a major obstacle, the enemy had sited their positions skillfully to cover it. Time after time Marines forced a crossing, only to be obliged to withdraw owing to their inability to dislodge their stubborn and all but invisible opponents. The consummate skill of the Japanese in construction of field fortifications needs no elaboration here, save that several peculiar features of this particular region served especially to their advantage. The jungle both curtailed their attackers' freedom of movement and enhanced their own concealment: Marines had to get within a few feet of the emplacements in order to locate them, by which time few were left alive to spot them for others. A man cannot hit what he cannot see, especially when he himself is wholly vulnerable. 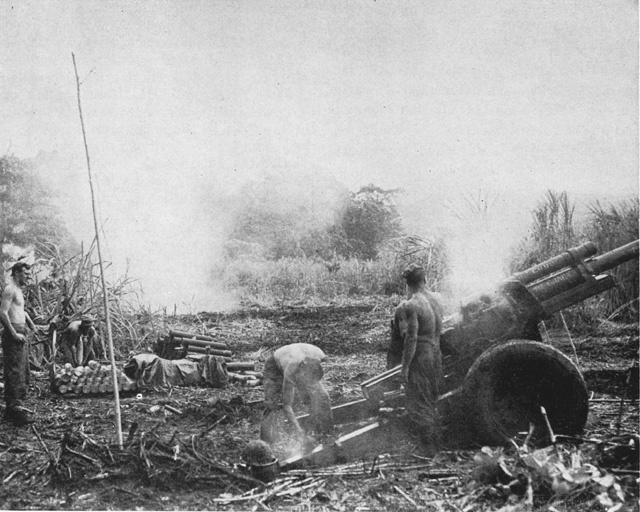 Even their lack of fortification materials--cement and steel reinforcing--reacted in favor of the Japanese, for the earth-and-log bunkers which they improvised perforce were too soft-surfaced to detonate bazooka rockets, the heaviest weapons the infantry was capable of bringing to the point of contact. To support these bunkers, they had dug deep fox holes between and under the flaring buttress roots of the giant trees characteristic of the region, camouflaging them with foliage and cutting cunningly interlocking fire lanes. Artillery and mortar shells and air bombs were all but useless in reaching these positions, owing to the fantastically high forest cover that usually caused tree bursts, to which the deeply dug-in enemy was virtually invulnerable. So for two days the assault battalions fought what amounted to a stalemate, paying a high price in casualties for negligible gains, while engineers of Company C, 17th Marines labored mightily to build a corduroy causeway across the coastal swamp to enable tanks to reach the scene of action. A betting man might have obtained good odds that it could not be done;26 but during the afternoon of 3 January, three General Sherman mediums lumbered up to the near bank of Suicide Creek, looking reassuringly big and formidable to the hitherto unsupported infantrymen. deep, but the 12-foot banks were too high and steep to permit traverse.27 The engineers solved this problem by ordering up a bulldozer, which promptly went to work cutting away the jungle and pushing the near bank down into the stream bed to form a usable approach. The Japanese hit the driver in a few minutes, but another volunteered for his place. He, too, was hit, despite the Marines' efforts to reduce the enemy fire by increasing their own. A third managed to complete the difficult and dangerous mission by rather novel means: keeping on the ground in the lee of the moving vehicle rather than in the exposed driver's seat and operating the controls with a shovel and an axe handle. The job was finished by nightfall. At 0800 on the morning of 4 January, following a 15-minute artillery preparation, the first tank commenced a gingerly negotiation of the improvised ramp, wallowed through the shallow water and successfully mounted the opposite bank, infantrymen clustered around it in close support. Two Japanese, evidently forewarned, hesitated just too long in attempting to apply the explosive charges they carried. From that point onward, everything proceeded much more simply. The other tanks followed their leader, and their murderous 75's made short work of the Japanese emplacements at point-blank range, the supporting infantry disposing of those of the enemy who attempted flight. Pausing to reorganize, the two assault battalions surged forward across their whole front, encountering no further opposition than that provided by the jungle and reaching the 0-1 phase line shortly after noon. Encouraged by this victory and the apparent death or withdrawal of all Japanese in contact to the immediate front, General Shepherd ordered the advance continued, changing direction to south-southeast, to Phase Line 0-2, which was secured late that afternoon. Meanwhile, the 2d Battalion, 7th Marines, pinched out by the successful sweep of its former front and the tying-in of 3/7 with 1/7 on the left, executed a wide swing inland, made contact with the right of 3/5 and extended the line westward. Battery D, 1st Special Weapons Battalion, operationally attached in group reserve, moved out also to protect the extreme right flank in case of enemy attack from that direction. Thus, the ADC Group dug in for the night of 4 January along a four-battalion front as shown in Map No. 14: from left to right, 1/7, 3/7, 3/5 and 2/7. And here the troops rested throughout the following day, while patrols probed to their front and officers of the staff sought to analyze a piece of puzzling and disconcerting intelligence recently come into their possession. Despite this admonition, Yamaguchi, with that seemingly incredible indifference to basic security which the Japanese so often demonstrated, simply stuck the dispatch in his pocket and carried it with him to the assault. Marines found it on his body the following morning, thereby gaining their first inkling of the existence of a terrain feature which appeared as such on none of their maps but upon which the Japanese appeared to place great importance, for reasons not yet clear. FIRST TANK across Suicide Creek. 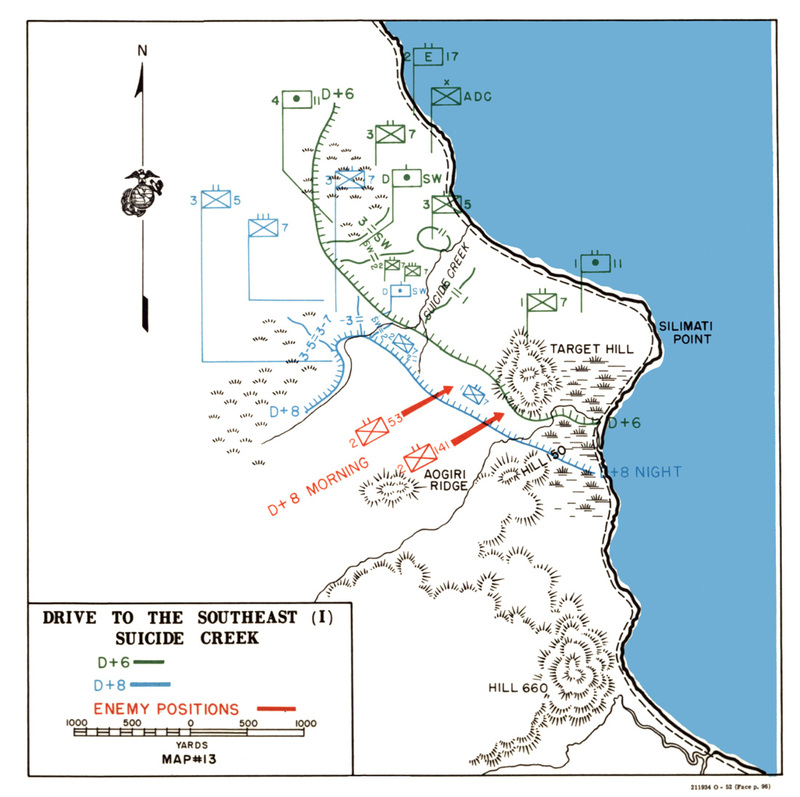 During the pause on 5 January, the 3d Battalion, 7th Marines was pulled back from the line into reserve behind the center, the resultant gap being closed by 1/7 and 3/5 extending toward one another and tying-in their flanks. The Weapons Company, 7th Marines took over the extreme left, along the shore, operationally attached to the 1st Battalion, and in this formation the attack jumped off once more at 1100 on 6 January: Wps/7, 1/7, 3/5 and 2/7. Tanks moved up to support the left, where patrols had discovered an enemy road block along the coastal trail the previous day, and artillery placed 15 minutes preparatory fire on Hill 150. MARINE MACHINE-GUN position on Cape Gloucester. that Hill 150 was definitely not the Japanese Aogiri Ridge. But no further intelligence of value turned up to help locate that key position, and no other marked elevation could be discerned in the region because of the dense cloaking jungle. Speculation ran rife, most deductions placing it tentatively from 1,000 to 2,000 yards to the southwest of the present scene of major action.33 This made good sense, as the ground rose in that direction and a strong point there would possess great tactical value in defending the approaches to Magairapua, now known to be the location of the 141st Infantry's command post and to be near Matsuda's own brigade headquarters. This caused some concern for the security of the attackers' right. 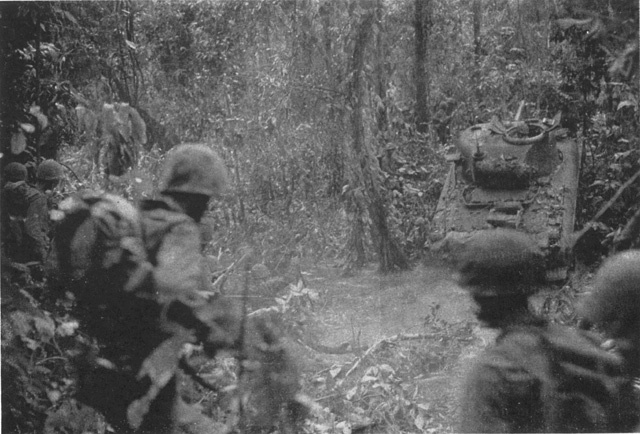 As a result, the 2d Battalion, 7th Marines, advanced only its left company in order to conform with the progress of 3/5, so that its line that night described a wide arc spanning the jungle between two large kunai patches.34 Battery D, 1st Special Weapons Battalion, still in group reserve, remained in position to furnish flank protection. The front showed little change throughout the next two days. The inability of the Marines' center to make progress against the enemy position necessitated the flanks holding fast. Fighting progressed largely according to the pattern of the previous affair at Suicide Creek, with the Japanese in greater force holding even more thoroughly prepared positions. Again, the nature of the terrain prevented effective flanking of the pocket, and tall rain forest largely nullified supporting fire. And again engineers and pioneers of the 17th Marines worked day and night to build a log causeway capable of bearing tanks across the intervening swamp from the coastal road. DRY FEET were only a memory during December and January. LIEUTENANT COLONEL WALT led the attack on Aogiri Ridge. increasing steepness. This feature, combined with the unremitting fury of Japanese resistance, struck Walt as significant, and although the unit fell back to its morning positions to dig in for the night, he was convinced that he had discovered the true Aogiri Ridge. The night passed in comparative quiet, as had all night heretofore since the beginning of the southward drive. The Japanese confined themselves to random small arms and mortar fire, occasional short, sharp thrusts or minor infiltration attempts, rather than frittering away their strength in serious counterattacks. The assault battalions resumed the attack on the morning of 9 January in the wake of heavy artillery concentrations placed both in front of Hill 150 and on what Walt believed to be Aogiri Ridge. In an attempt to flank the Japanese position from the northeast, elements from Company C of 1/7 succeeded in knocking out two enemy bunkers with white phosphorous grenades but could get no farther, while the battalion's attempts at frontal assault made no progress whatever. THE 4TH BATTALION, 11TH MARINES, providing fire support from its kunai patch. The Japanese first line of defense consisted of a chain of 37 log and earth bunkers extending about 200 yards along the ridge's military crest. These were liberally equipped with automatic weapons and in many cases connected by underground tunnels. Thus, Marines would destroy the enemy in one bunker only to have replacements crawl in from elsewhere and resume the fight, making it necessary for Walt's men actually to occupy each position in turn. So the Marines had a foothold on the crest of Aogiri Ridge. But so did the Japanese; both farther along the first line of bunkers and in a second line on the reverse slope. As the rainy night wore on, sounds of increasing activity from the latter direction indicated that they were receiving reinforcements and preparing for the inevitable counterattack. Colonel Walt got all available weapons into position to hold, including the 37mm, and all available men, including battalion headquarters personnel.40 Then he called for mortars and two battalions of artillery to register to his front. AN 81mm MORTAR lobbing shells into the Japanese positions. As the fifth Japanese charge began, Colonel Walt coolly directed his forward artillery observer to call down fire at successively reduced ranges, until the 105mm shells from 4/11 were hitting a scant 50 yards in advance of his lines.44 His small-arms ammunition was dangerously low following the fourth banzai, but a battalion command post detail rushed a resupply to the lines in time to repulse the final attempt, with exactly four minutes to spare.45 This fifth charge, though furious, had been blunted by artillery fire46 and now it broke before the determined stand of the Marines. The Marines were glassy-eyed with weariness when dawn arrived. 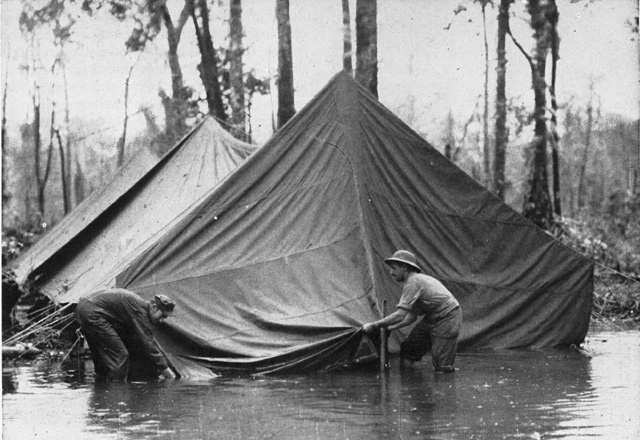 But the Japanese, for all practical purposes, were through so far as concerned the Cape Gloucester campaign. Ordered to hold Aogiri Ridge at all costs, they had committed their only effective reserve47 to this end, and it had not been enough. Now they had no ridge and no reserve. As events would prove, they had shot their bolt. INFANTRY-SUPPORTED light tanks finally got into the Japanese pocket between Hill 150 and Aogiri Ridge. At 0800 on 10 January 3/5 moved out to secure the entire area and quickly discovered why the enemy had attached so much importance to the ridge. 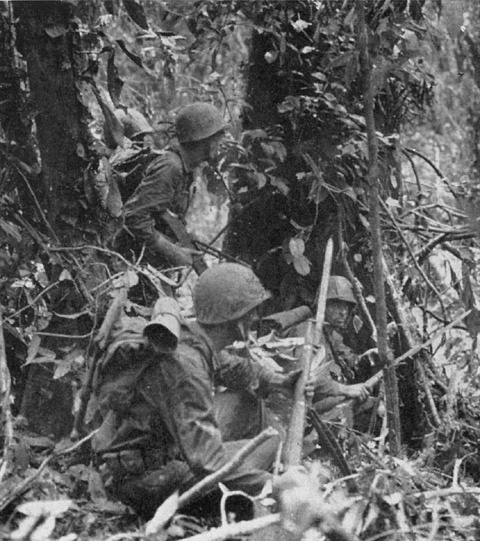 Advancing with five companies abreast toward the next high ground, the Marines soon found themselves crossing a wide, firm, much used trail that showed on none of their maps,48 leading inland in the general direction of Magairapua. Clearly the Japanese had constructed this during their occupancy as the main supply route connecting their headquarters and principal bivouac areas with the Borgen Bay dumps and landing points, camouflaging it so cleverly as to defy aerial observation. To realize that retaining control of it was vital to the Japanese position required no profound insight. The fact that possession of Aogiri Ridge afforded such control had made that elevation the key factor in enemy tactical thinking from the moment the Marines had begun their drive to the southeast. But all of these factors could not be appreciated at once. More hard fighting would occur, though on a smaller scale, before the Borgen Bay area could be called secure. PATROL MOVES OUT against background of shell-shattered jungle. partially pocketing this in the saddle between the ridge and Hill 150. 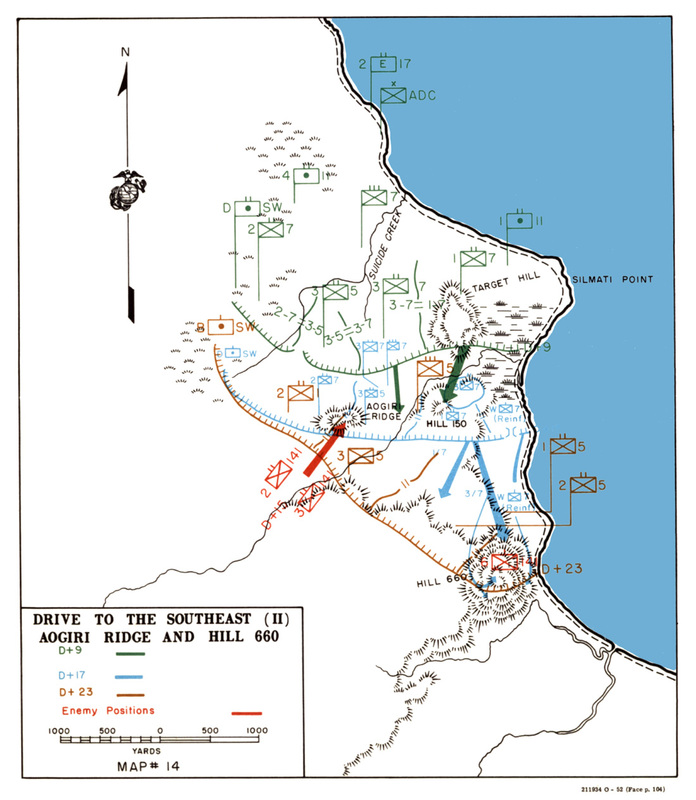 Throughout 10 January the battalion maintained pressure, but without heavier weapons and some armor the terribly vulnerable attackers were unable to make headway against the well dug-in Japanese. But the handwriting was on the wall. The engineers had completed their corduroy causeway across the swamp as far as the base of Hill 150, and further labors brought a platoon of light tanks and two half-tracks to the scene of action during the morning of 11 January. But pinching out the pocket remained a grim business, nonetheless. Company B came down again from the high ground, again fell back before the murderous fire of concealed weapons. Company C attacked in its turn, with the same result. Even after the guns and armor got in, crushing the last organized resistance required four hours of systemantic slaughter. But crush it they did, tanks, half-tracks and infantry working as a team, and during the afternoon 1/7 surged forward against only scattered sniper fire to consolidate the entire front along the 0-4 phase line. in the area,49 loss of which must prove a severe blow to a force already short of almost everything. What had become of the Japanese, however, remained a moot question. Clearly, they had been able to withdraw at least some troops from both Aogiri Ridge and from the pocket, and no contact with the 2d Battalion, 53d Infantry had been reported for several days. Enemy troops numbering between 2,000 and 3,50050 were estimated to be still active in the region; yet Marine patrols operated 1,500 yards southwest along the trail without discovering anything of interest,51 while others working southward found no enemy short of Hill 660. The Marines spent all of 12 January resting and reorganizing preparatory to assault on what had been designated the final objective: that conspicuous landmark, Hill 660, securing of which would deprive the Japanese of their last vantage point from which to interfere with operations on the landing beaches. The enemy occupied the position (the only position they were now definitely known to occupy) in strength estimated at one reinforced company52 supported by a number of weapons of the 30th Machine Cannon Company and one 75mm gun. Designated to cooperate with the main effort was a secondary force of rather odd and interesting composition, headed by Captain Buckley of the Weapons Company, 7th Marines and based on elements of his own unit: two half-tracks, two light tanks and a 37mm gun platoon.53 To these he added a rocket DUKW, two platoons of infantry from 1/7 and a platoon of pioneers from the shore party, who brought along a bulldozer. This group had as its mission to advance along the coastal track and establish a strong road block between the eastern base of Hill 660 and the shore of Borgen Bay, thereby flanking the position and cutting the defenders' most practical route of retreat. Since this movement required an advance of approximately 1,700 yards through what was technically enemy territory and the setting up of a perimeter in the lee of a dominating Japanese-held elevation, it entailed very definite but calculated risks. and arrived in assaulting position an hour and a half later without encountering any resistance. The terrain here was especially difficult. The rising ground of the approach dropped sharply to the northern base of the hill proper, thus forming a deep gulch, both slopes cluttered with trees and jungle undergrowth, and strewn with boulders. The colonel set up his command post on the near lip of this ravine, while his assault elements descended the first slope and started up the second. So steep was the grade that in many places the men were obliged to sling their weapons and claw their way upward on all fours. The ascent of this face of Hill 660 would have constituted something of a feat under the best of circumstances. When the Japanese chose to dispute it, further progress became impossible. This they did from a system of small arms and automatic weapons positions about one-third of the way to the summit, pinning down Company I, the leading element. Company L, attempting to swing to the right, soon met a similar fate. The Japanese had still another machine gun farther along in that direction capable of enfilading the line of advance sufficiently to prevent withdrawal. As the day wore on and those elements still retaining mobility continued probing to the right in search of a soft spot or a flank, engineers worked a light tank forward far enough to place fire across the gorge on the more troublesome enemy weapons. By late afternoon this, together with artillery supporting fire,54 made possible extrication of the pinned-down companies, which thereupon withdrew to tenable defensive positions for the night, having accomplished nothing of note. A PORTION OF Captain Buckley's Weapons Company in position at the foot of Hill 660. WATERPROOFED TENTS were not prepared for this sort of thing. THIS MACHINE GUNNER has just been relieved at Hill 660.
unusual and apparently bloodless duel continued. The night passed quietly on both fronts, and at 0900 on 14 January the 3d Battalion resumed the attack.57 Again the companies probed around to their right, gradually working their way upward, while tanks were brought forward laboriously in support. By midafternoon the leading elements had more than half circled the hill and found themselves ascending its southern face, where two deep ravines finally brought the tanks to a stop. A few evidently escaped to the safety of the swamp at the hill's southeastern base. One group estimated to number upward of 30 fled down the northeastern slope into the pocket formed by the Weapons Company's road block, where they made things lively for Buckley's people during the night by trying to break through or around the position.60 A rain-soaked dawn showed many of them dodging through the jungle beyond the cleared field of fire, attempting to reach the same swamp by skirting the perimeter. They found the telephone wire and cut it,61 to the captain's considerable annoyance. Again a few of them appear to have escaped, as only two dead, one of them a lieutenant, were found directly in front of the position. to signal their achievement to the Weapons Company below before the breaking of a furious rainstorm accelerated the onrush of dusk to eliminate visibility. The exhausted men dug in as best they could among the dead Japanese, but the storm lasted all night and no counterattack occurred; which was just as well, as the Marines were in no condition to give the best account of themselves. The weather cleared the following day, bringing some rest to the weary and additional automatic weapons to consolidate the captured position. Continued mopping-up operations netted a few stragglers but revealed no formidable enemy forces. 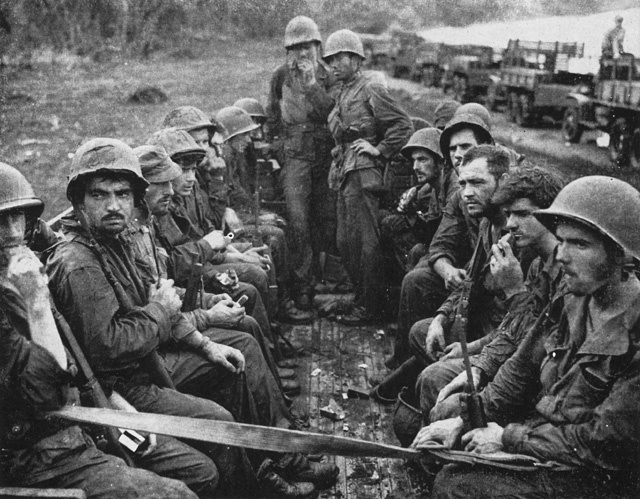 THE STRAIN AND FATIGUE of 23 days on the line at Cape Gloucester is clearly shown in the faces of these men of the 7th Marines. Simultaneously, Captain Buckley's group repulsed a weaker attack on the coastal flat without much difficulty, killing 48 more of the enemy. Somewhat earlier the same morning a platoon of 30 men and one officer64 made an infiltration attempt against the lines of the 1st Battalion, 7th Marines, but these several occurrences constituted the last gasp of the Japanese in this area. With accomplishment of this phase of the ADC Group's mission, extensive reorganization became the order of the day. 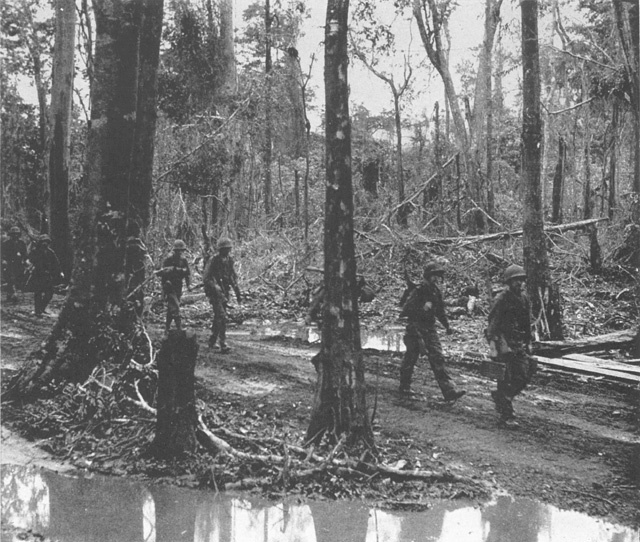 The 7th Marines as a regiment, together with 3/5 and their various supporting elements, had carried the burden of the campaign's heaviest fighting: a sustained drive of two weeks duration, moving cross-compartment through some of the most difficult jungle territory in the world, enduring some of the worst weather in which troops were ever required to operate. The first relief took place on 15 January, the 2d Battalion, 1st Marines, recently in from GREEN Beach, taking over the right flank sector from 2/7 (less Company G), which moved to the airdrome area. The following day the 2d Battalion, 5th Marines relieved 1/7 (plus Company G), on the line, and that regiment's commanding officer, Colonel John T. Selden, took over command of the area from Colonel Julian N. Frisbie, of the 7th. But not until the 18th was relief effected for the 3d Battalion and the Weapons Company (by 1/5 and Wpns/5 respectively), whereupon Combat Team C reassembled as a unit on the now quiet airdrome perimeter for rest and rehabilitation.65 Some indication of how badly the men needed this is indicated in the accompanying photograph on page 111, taken on the scene. So, for all tactical purposes, the Cape Gloucester operation was over, and the southern perimeter as finally set up appeared as shown in Map 14. But what had become of the Japanese? 1. ADC-2 Journal, hereinafter cited as ADC-2. 2. 1st MarDiv SAR, III, 1. 3. D-2 Weekly Report No. 1. This document also cited a captured ration statement indicating that a total of 5,374 troops drew on the Natamo supply depot on 7Dec43, but did not attempt to estimate how many of these were actually in the immediate area. 4. POW No. 104, previously cited in Chap VI. 5. ADC Group Opn Or No. 1-44. 6. The reader is reminded that this monograph is written with the perspective of years, after study of material pertaining to each side of which the other side was in total ignorance at time of the actions described. 7. Although Col Katayama set his organization in motion immediately upon receipt of the 26Dec order, Matsuda on 27Dec issued two more separate orders directing Katayama to join him in person at once. In addition, Matsuda filed an order with the IJA 17th Div, Eighth Area Army and Fourth Air Army informing them of what he had in mind. ATIS 721, 2 & 5; ATIS 754, 7. 8. ATIS 721, 2. Orders issued at this time provided for leaving skeletonized garrisons at the strong points of Nigol, Aisega and Cape Bushing, but subsequently even these were ordered up to the scene of the fighting. 9. This was the place that appeared on U.S. maps as Nakarop, though the Marines were unaware of the fact at this time. See discussion of place names in Appendix III. 10. 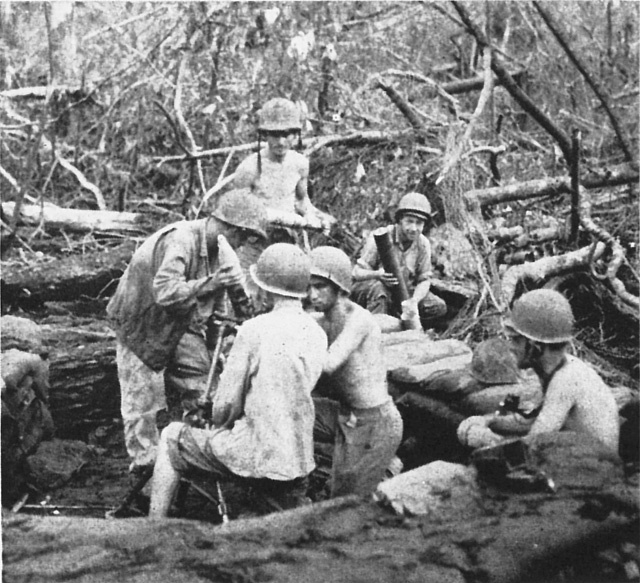 Months later the 1st MarDiv encountered a similar Japanese command situation at Peleliu, where U.S. officers were not even aware of a major general's presence on the island until the operation was virtually over. 11. Evidently a tactical on-the-scene designation, as the 65th Brigade, as such, continued to be referred to as the Matsuda Butai in 17th Division orders. 12. Members of a number of units were identified among the infantry in the subsequent fighting: artillerymen who had lost their guns, shipping engineers without ships, etc. However, the extent to which the battalions were thus reinforced is nowhere clear. 13. An example of the Japanese proclivity for making the simple complicated: one company of 3/141 had accompanied that regiment's 1st Battalion to Arawe, while one 1st Battalion company and part of another were attached to Tatsumi's group during the Borgen Bay fighting. 14. Lt Abe has been described as one of the best liked and most capable company officers in the 65th Brigade, and his subsequent death as a severe loss to the Mukai Group. POW 191. 17. Col J. E. Weber, comments on prelim script and ltr to the author, hereinafter cited as Weber. The colonel goes on to say in possible extenuation of the enemy: "The Japs apparently figured that this [gap] was well defended; such conclusions [could be] drawn from observation of much Marine activity in there the day before which in reality was the passage of Marines carrying in supplies for our somewhat extended front lines." 18. Ibid. The Japanese also dug lateral trenches for shelter when getting into position to assault. 19. Still another possible contributing factor is described by an officer who searched Lt Abe's body after the fight: "He appeared to have all of his worldly possessions with him. As well as I can remember he had on two pairs of pants, two or three shirts, a raincoat, and was carrying a heavy pack with a coat strapped to the pack. This was in addition to his sword, pistol and entrenching tool. He carried all this equipment while leading the attack up this steep hill." Moore. 20. It was just about 10 feet or so below his position that I found Lieutenant Abe. . . . I search his body . . . and turned the papers mentioned over to Capt Gregg--ADC interpreter. I have Lt Abe's field glasses (his name is lettered on the case) & wallet containing receipt for purchase of a sweater in Manila." CWO S. J. Fishel, comments on prelim script and ltr to author, 29Mar52, hereinafter cited as Fishel. 22. Ibid. There are at least two witnesses who reported that Katayama survived the entire campaign: POW 191, POW 1000. Or the "screaming" officer might have been Capt (or Maj) Mukai, CO of 2/141, also reported to have survived. 23. Col Katayama reported this action with characteristic Japanese lack of realism: "By the desperate struggle of the officers and men of the Regiment, Sankoku Yama had been captured and the enemy were forced to the water's edge, but, owing to the enemy counter-attack with superior forces, we have relinquished it again with much regret." ATIS 733, 4. 24. "The ones of us on the hill realized the seriousness of the situation but it took some time to convince Battalion Hqs that we were doing other than shooting at shadows." Moore. 25. One modern writer has likened this scheme to that employed by General Sherman against the fortified approaches to Atlanta in 1864. Pratt, op. cit., 314. 26. The ingenuity and perserverance displayed throughout the Cape Gloucester campaign to bring tanks into action through terrain in which they were never designed to operate proved a source of wonder to many people. See VI Army Observer's Report. 27. 17th Mar R-2 Journal. 28. 1stMarDiv File of Captured Documents. 29. The Japanese themselves appeared confused on this point, two crudely printed maps of theirs showing Aogiri Ridge in as many different locations: where Hill 150 stood, and approximately where the ridge was discovered to be. Ibid. 30. While waiting for the tanks to come up, Co A's CO called for artillery fire, which was delivered with extreme accuracy. Moore. 31. This later proved to be the coastal terminus of the vital supply route from Japanese headquarters to the Borgen Bay dumps and landing points. (See below). The trail was well defined, with a bridge in excellent condition crossing the swamp inland of the beach area. Ibid. 32. ADC and 1st MarDiv reports both state that all assault elements reached the 0-3 phase line that evening. 33. Most reports covering this period give coordinates for the tentative location of Aogiri Ridge, all of them much farther to the southwest than proved to be the case. 34. The easternmost of these kunai patches was designated No. 6, the other and larger No. 3. D/Spl Wpns was emplaced along the near edge of the latter directly behind 2/7, forming in effect a refused flank. 35. LtCol Puller, 7th Mar executive officer, had assumed temporary command of 3/7, on 4 Jan upon the relief of the original battalion commander. He exercised simultaneous command of the two battalions until the next morning, but retained control of 3/7 until 9 Jan when LtCol H. W. Buse, Jr., formerly assistant D-3, arrived to relieve him. 7th Mar R-2 Journal. 36. Two days earlier LtCol W. K. Enright, executive officer of the 5th, became assistant D-3 of the 1st Division and was succeeded in his regimental assignment by LtCol Walt. Thereupon command of 2/5 fell to Maj G. D. Gayle, formerly R-3. 37. Col L. W. Walt, correspondence with the author and comments on prelim script, hereinafter cited as Walt II. 38. "Walt called for volunteers; there were none forthcoming. He then grabbed the 37 himself and attempted to push it up the ridge. In doing so, he pulled both arms out of their shoulder sockets. . . . Immediately on seeing their new battalion commander and his orderly (runner) on the gun, Walt had plenty of volunteers." Ltr MajGen J. T. Selden to author, 7Mar52. 39. 1st MarDiv SAR, III, 10. 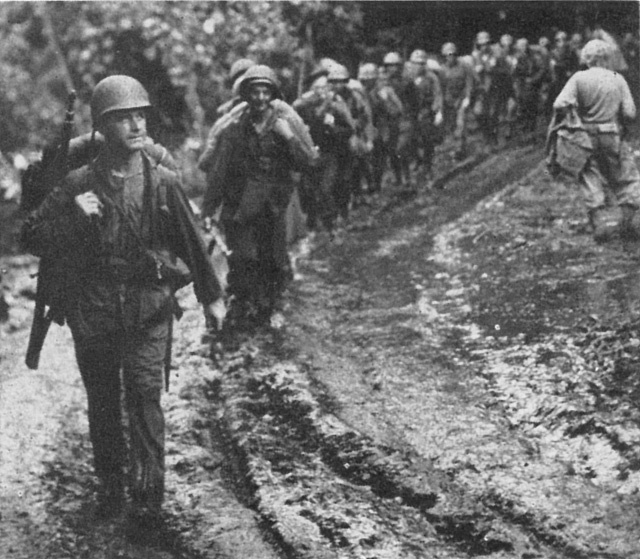 "Colonel Walt practically carried the battalion on his shoulders, himself lugging forward a 37 to the edges of the ridge." Pratt, op. cit., 317. The elevation became "Walt's Ridge" thereafter by order of Gen Shepherd. 40. "It was a desperate measure taken against overwhelming odds. Bn Hq consisted of one runner and myself." Walt II. 41. "For at least one hour during this period the Japs were clearly chanting 'Marines prepare to die.'" Walt II. Gen Shepherd corroborates this curious incident in interview with the author 22May 52. 42. Presumably Maj Asachichi Tatsumi, CO of 3/141, although one Japanese source (POW No. 191) reports him as surviving the campaign. Same source describes him as reserve officer of 50 but highly regarded as a sound military man. 43. Ltr Col L. W. Walt to author, 24Apr52. This source adds: "The Jap major . . . was about 50 yrs of age and medium build . . . He actually died three paces from where I was crouched 45 in hand waiting for him." 44. Maj A. M. Roebuck, comments on prelim script. "At 0300 I was in the fire direction centre of the 4th Battalion 11th Marines. . . . I recall Major Joe Russell and I objecting vigorously as the range kept on being reduced until we were practically firing on our own troops." Bowdoin. 45. 1st MarDiv SAR, II. Japanese infiltrators attempting to cut the Marines' supply line, killed one of this detail and wounded two. 46. "The following morning a captured enemy related how this arty barrage caught the reserve company in a mass formation just ready to make the 5th assault. This was evidenced by a count of better than 150 mangled bodies in that immediate area the following day." Walt II. 47. 3/141 (Tatsumi Shitai), newly arrived in the region and not previously committed. ATIS 754, 4, lists both this unit and 2/141 as in this action. A prisoner taken on 10Jan verified this, but apparently he died before his testimony could be formally transcribed as no record of its existence can be found in the interrogations file for the operation. 48. The coastal terminus of this trail had been secured two days earlier by A/7, but that stretch had been reduced to such bad condition that its importance was not immediately recognized. 50. D-2 Weekly Report No. 8. 51. Had patrols moved farther in the direction of Magairapua, the closing phases of the campaign might have turned out much differently. However, no one had any very clear idea of where Magairapua lay, which was probably fortunate in the light of subsequent developments. See Chap VIII. 52. Subsequently identified as 6th Co, 2d Bn, 141st Infantry. 1st MarDiv D-2 weekly Reports. 53. This somewhat conglomerate force included an Army sergeant who had gone AWOL from his service unit in New Guinea and stowed away on an LST in order to get to the scene of combat. Since the Marine Corps has never been noted for spurning men who really want to fight, Capt Buckley assigned the sergeant a position in the little perimeter, where he acquitted himself creditably during the ensuing action. He rejoined his own unit subsequently, where, according to rumors reaching the island, his reception was somewhat less cordial. 54. "The top and rear of Hill 660 could have been plastered with our artillery, but . . . our overs were disturbing Capt Buckley. We switched to high-angle fire; but Capt Buckley, by that time was too far around the hill, prohibiting further artillery support." Russell. 55. This proved to be quite a complicated operation. 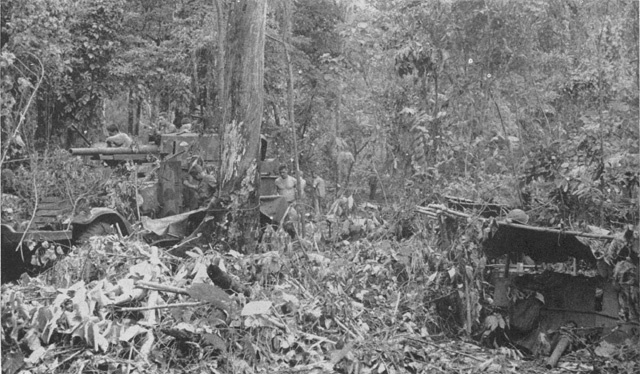 Capt Buckley had to use his bulldozer to push the truck through one particularly muddy stretch of road, and fire from his tanks and half-tracks to silence Japanese guns on top of the hill. See below. Nevertheless, he contrived to get his men one hot meal a day during the several days he occupied the position. 56. 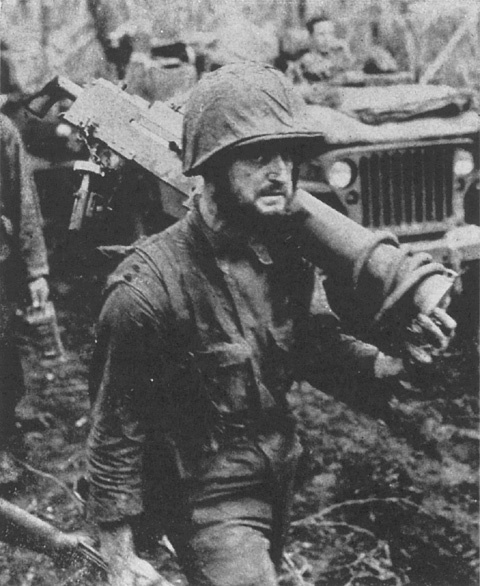 Capt Buckley's report to regimental headquarters, 7th Marines R-2 Journal. "Something heavier" was either one of the several 20mm machine cannon or the 75mm gun subsequently found on the hill. 57. "The heaviest artillery preparation of the entire operation signalled the attack on the morning of 14 Jan." 7th Mar WD. 58. Companies E and F of 2/7 were moved into the line with the 3d Bn on Hill 660 just about dark, but with the successful assault on the hill completed they saw no action that night. 7th Mar R-1 Journal. 59. 1st MarDiv SAR, III, 14, makes this statement. Actually, it was true only to a limited extent, as Buckley had to keep his fire below the military crest for fear of hitting men of the 3d Bn. These were hampered in turn by his presence and some of their fire did fall within the Wpns Co lines. 60. Four Japanese wearing what appeared to be American helmets were mistaken for a Marine patrol and got to safety along the beach in the darkness. Four others were killed wading through the shallow water offshore in an effort to bypass the block. The pioneer platoon mowed down another group of eight, also attempting the beach, with such devastating effect that they fell in perfect column of twos formation. 61. 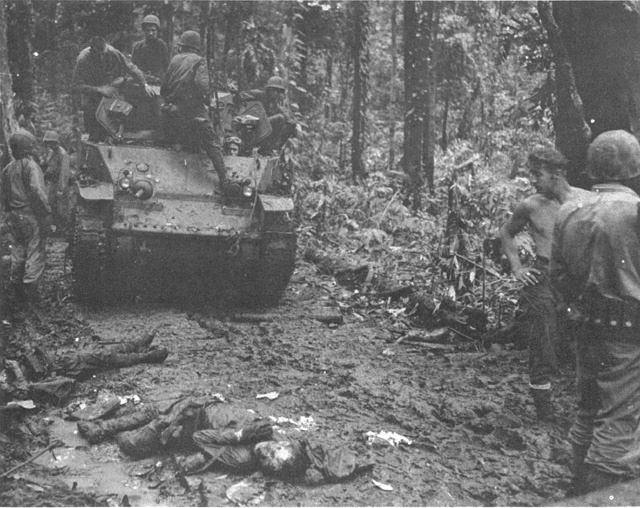 Capt Buckley maintained his CP in a half-track facing the area where the Japanese were cut off. The wire was quickly repaired as soon as the enemy were eliminated. 62. Identified by intelligence officers as 6th Co (or what remained of it) of 141st Infantry, and 11th Co of that regiment's 3d Bn. Japanese sources mention both battalions participating but do not designate elements. ATIS No. 754, 4. 63. 1st MarDiv SAR, III, 15. 64. A vestigial remnant of the 3d Co, 1st Bn, 53d Infantry. This identification provided the first conclusive evidence that any units of the airdrome garrison had withdrawn successfully to the Borgen Bay region. 65. CT C was earmarked for a special mission at this time: support of General MacArthur's seizure of the Admiralty Islands. The reinforced regiment stood by, prepared to embark and move in on short notice, until the Army's surprisingly easy landing on 29 Feb made clear that its services would not be needed.